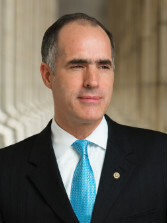 Editor's note: Robert Casey, a Democrat, is a U.S. senator from Pennsylvania. (CNN) - CNN and the Cartoon Network's presentation of the AC360° special feature, "The Bully Effect," spotlight a serious issue affecting children across our nation. The film underscores the damaging consequences of bullying and the need to prevent and respond to it. The impact of bullying for students and for our nation are severe. In an era when a quality education matters greatly in a competitive global economy, students must be able to focus on their studies. Bullying distracts students who worry more about surviving the day unscathed than about the grades on their report card. Research has indicated that bullying causes increased absenteeism, dropout rates and academic underachievement, all of which undermine a child's ability to succeed in the classroom and beyond. I am particularly disturbed by stories of bullied youth who feel powerless to change their situation and who choose not to seek help from adults. A recent report from a newspaper in my home state of Pennsylvania told the story of a 12-year-old boy who regularly asks his parents not to report when he has been bullied because he fears possible retaliation. Rather than speak up about the threatening environment at school, he felt that his only option was to keep quiet or risk making things worse. Putting an end to bullying will require a consistent message from adults, including lawmakers, that young people can make a real difference in their lives and the lives of others when they speak up about bullying and harassment. Recently, I reintroduced bipartisan legislation to help prevent bullying and harassment - the Safe Schools Improvement Act. My bill, which I'm proposing with co-sponsor Sen. Mark Kirk, R-Illinois, will require school districts that receive federal funding to develop codes of conduct that specifically ban bullying and harassment.